The trip as it is planned as of now. We rolled into town thinking we still had a few hours before game time, as we thought the game started at 7:10pm not 6:10pm as the tickets said (it actually wasn’t until we were in the park and heard the National Anthem being sung that I looked at the ticket a bit closer), so we took our time looking around town before we made our way to Miller Park. 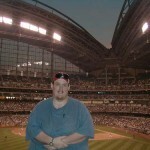 I had just been to Miller Park back in May for 2 games, so I enjoyed getting to show Bob around the park. 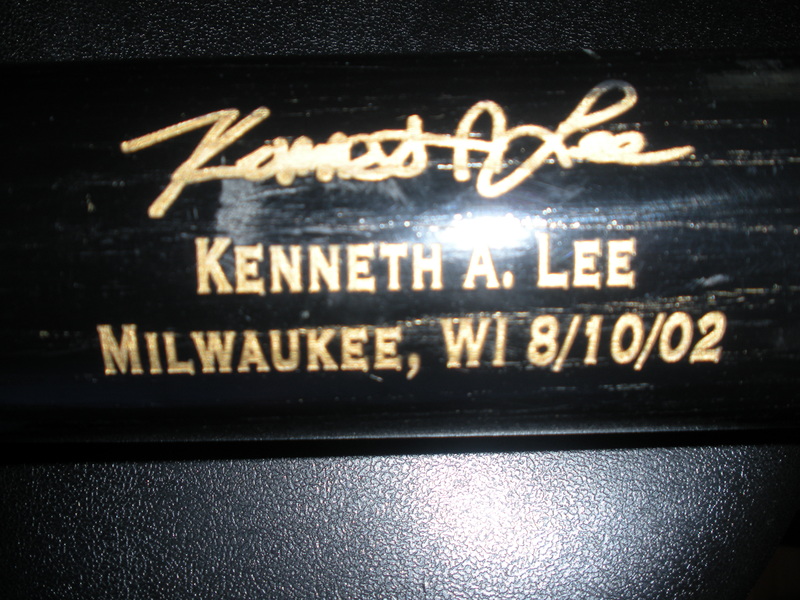 When I was last there I saw a vendor that engraved bats for you with basically whatever on it you wanted. I had told Bob about this place, “Sticks By Stan”, so we decided to go check it out and get a bat made. 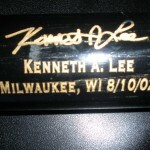 On mine I put my name, where we are and I opted for putting my signature on the bat. The worst part about that is that I had to sign with a sharpie, so it wasn’t the best signature, but it was still kinda cool. Bob had one made with his sons name on it, that was cool. We took the bats out to the car so we didn’t have to worry about them during the game, grabbed a couple brats, and made our way to our seats. 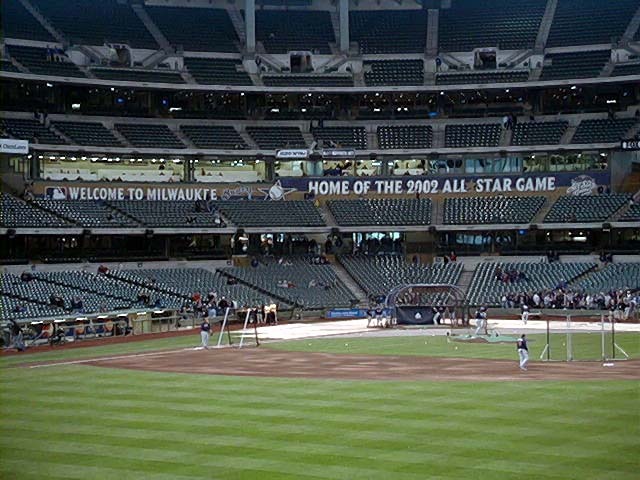 As we did in Chicago, we grabbed seats closer to the concourse that were open, instead of the our 1st row seats (ironically I have had a seat in the same section and same row for all 3 games I have seen at Miller Park now). The game was ok, always great to see a game live though. 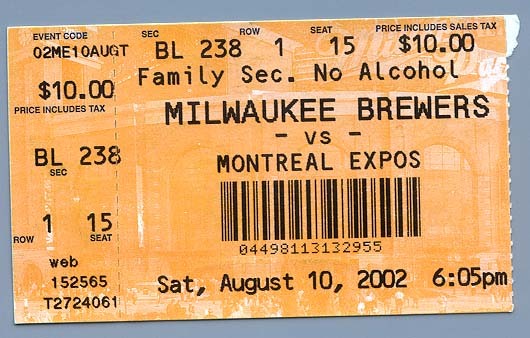 Was my first time seeing the Montreal Expos play. In the 2nd inning as Vladimir Guerrero came up I was telling Bob about him and his monster home runs and how just a few weeks earlier at the All-Star game festivities, here at Miller Park, Sammy Sosa was hitting balls out of the stadium just over to our left during the Home Run Derby. I barely got it said and Vladdy jacked a shot that had it not hit a cross bar might have left the stadium!! 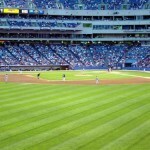 It was without a doubt the biggest home run I have ever seen in person! 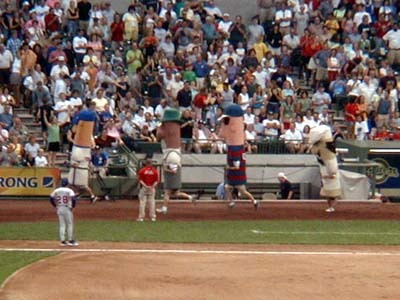 The Sausage Races are always run to watch, quite different than what goes on at any other ballpark. The rest of the game was, well, dull. 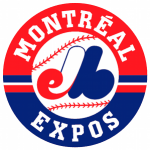 Then again we were seeing the Expos vs the Brewers, what did we expect, right? I can say that it was just great being there with my best friend and getting to share this experience with him. After the game we fought the traffic to get outta there and hit the road for Chicago. This was the last night of our trip and since we were flying out of O’Hare kinda early, we decided to stay that night in Chicago at the same Motel 6 (Rolling Meadows) I had stayed back in May. For dinner we stopped at Portillo’s for an Italian Beef sandwich… a must on any trip through the Chicagoland area, especially if I can stop at the one in Arlington Heights. This trip that Bob and I were on we were doing it for 1 reason…. 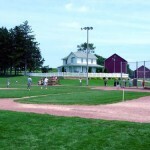 to play ball at the Field Of Dreams and TODAY was finally the day we would do it. We really didn’t know what to expect, honestly. We had read the web sites, we had read other reviews from when others had gone there for a visit, but would our trip there be anywhere near that? We had been planning this trip for months and it started off great last night in Chicago and the drive over here, about 4+ hours, was long, but fun. We got to see a great meteor shower even. But today was the day we were looking forward to! 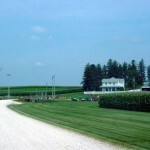 We got up, grabbed a quick bite to eat, and hit the road for the drive to Dyersville and the Field Of Dreams. Our plan was as such, go to the FOD, spend several hours there, then we wanted to go back into Galena, IL to check out a few things FOD related (from when they filmed the movie) and then back into Dubuque to see a few spots from the movie as well. At that point, if we had time, we would go back to the field for a while before calling it a night. 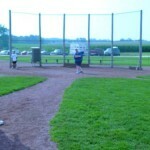 So we ended up at the field right about 9:30am and to our surprise there was several people, about 20 or so. We found a parking spot, one of the last few available, and started walking towards our first souvenir stand. See, if you don’t know, what you need to know is that the field actually sits on 2 families land. 1 family, the Ameskamp’s own Left & Center Fields. The Lansing’s owned the rest. Each had a souvenir stand, which confused us, until we started reading the signs. What we read was that the 2 families did not get along, at all. 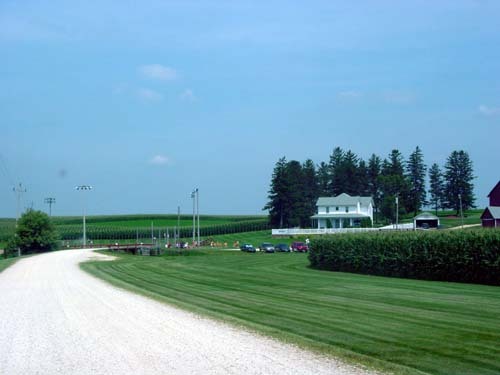 We also read that the Ameskamp’s had actually plowed up their side of the field after filming and replanted corn. It wasn’t until Mrs. Ameskamp told her husband, in shock, that people would want to come and see the field, that he corrected his mistake. 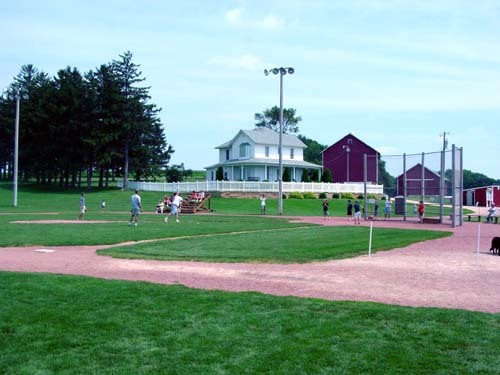 This is why the Lansing’s refer to their side as “The Original” Field of Dreams. Either way, our first stop was at the Lansing’s souvenir stand, only because it was the closest to where we parked. They had a lot of cool stuff and a ton of your usual tourist trap crap. 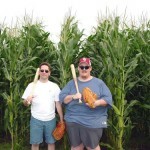 The 1 thing that stood out with Bob and I was the Louisville Slugger Field of Dream bats. We each bought one and planned to use it at the field. 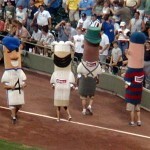 When we finally made our way towards the field, we weren’t sure how things would go. There was several people playing on the infield, and a ton more just roaming the outfield or playing catch with each other out there. 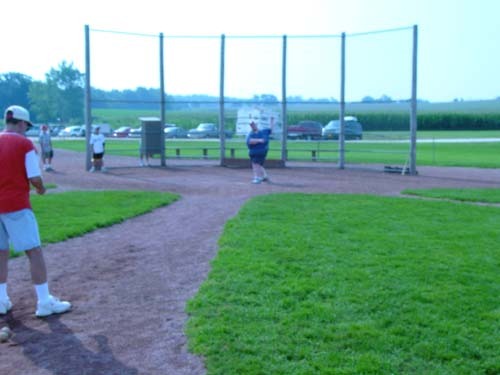 After spending a few minutes watching people playing the guy that was pitching told us they were doing a rotation, he was all-time pitcher, and if we wanted to fill in a spot in the infield, we could get in the rotation… so we did. 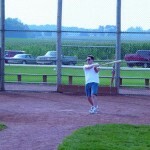 When it was our time to bat, Bob went first. There is something special about the crack of the bat. Bob got a few decent hits in. He did better than me that first time around, that’s for sure. I got a couple decent licks in, but nothing special. 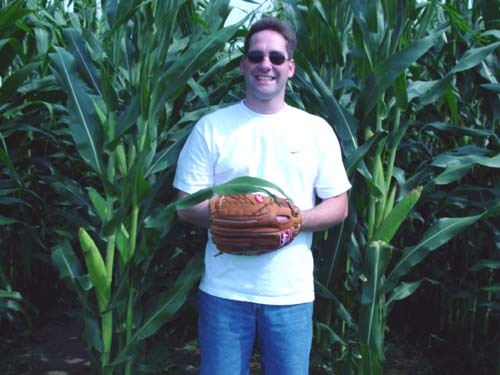 We spent a few hours playing around either with everyone else or just the 2 of us walking around the outfield out by the corn. 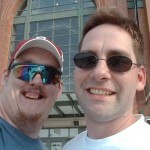 We did take a ton of pictures as well before deciding it was time to head into Galena. 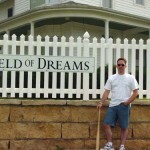 What I really need to say about the Field Of Dreams is that it was…. magical! There was something special about being there. 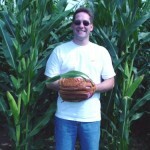 I have never been to Disneyland, but to me the Field of Dreams is the happiest place on earth! 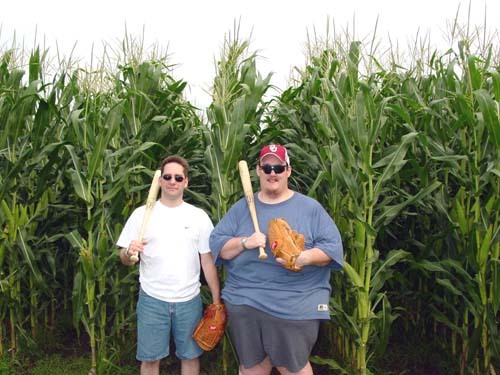 It was pretty close to what it looked like in the movie, the farm house, the field itself, the backstop, the corn… all awesome! There were a few reasons that we wanted to go to Galena. Not only was Galena the home of President Grant, there was also a tribute statue to him there that contained the name John Kinsella…. which of course is the name of Kevin Costner’s dad in the movie (not the same guy obviously). According to the extras on the DVD, this was pure dumb luck. They found it during a break from filming and say it was one of those eeerie moments or as they called them, an “FOD Moment.” Well, we found Grants house, yet even with the help of the tourist bureau we were unable to locate the Grant statue. We finally gave up and headed to a building in town that was having a Civil War show. They were to have a ton of artifacts on display and we thought that would be cool to see. So we got there about 4:45pm and while the sign on the window said it was open until 5pm, the doors were both locked already. No big deal, we decided to go back to Dubuque and check out the town. When we got to Dubuque, what we didn’t know is that they basically rolled up the side walks at 5pm. This left us a couple options, go to dinner and back to the hotel or find something else to do. 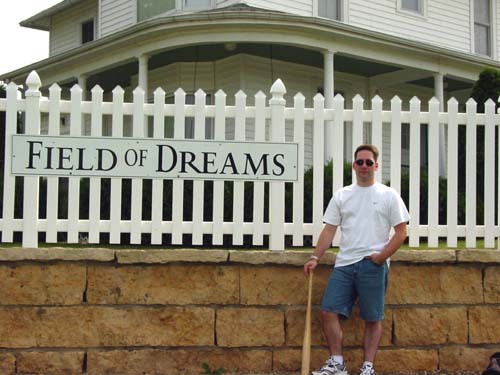 So having read about the theater there in town that did the World Premiere of Field Of Dreams, we decided to go see what was playing and got tickets to go see “Signs” and hit the Olive Garden for some dinner before the movie. The theater itself was like stepping back into the 70’s, with it’s orange shag carpet and all. Was weird. The movie was really good, I think being in a strange town, a theater we had never been to and seeing a semi horror flick, it all added up, but it was creepy. The strangest part was walking out the door after seeing a movie about aliens that inhabit a guys corn and all we can see is…. CORN! Had we been at home, this would have been really freaky, but we were in Iowa, so what did we expect, right? Our first stop was Wrigley Field. 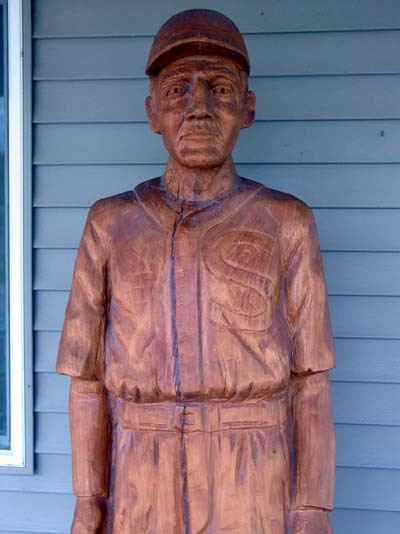 While the Cubs were out of town, Bob got to see the great shrine in the neighborhood. After Wrigley we made our way through downtown to see a few things, like the Navy Pier, Soldier Field, the “Bundy Fountain” and then made our way towards the South Side and Comiskey Field. 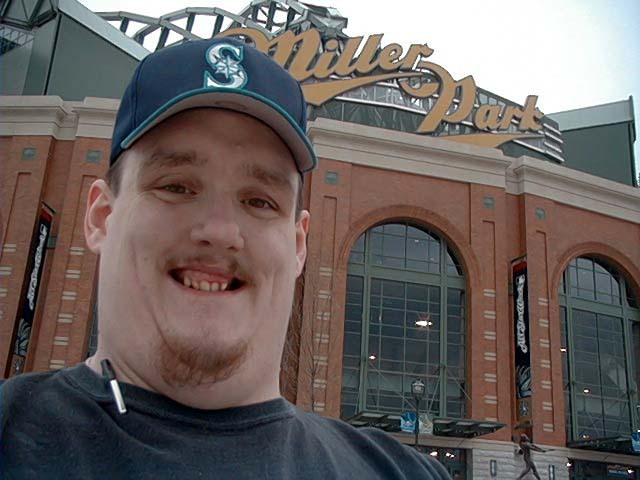 Other than the Kingdome and Safeco Field (both ‘home’ parks for us) Bob has never been to a game at another ball park, until today. I think I had more fun watching him looking around and taking it all in. We had plenty of time before the game so we made our way around the park looking at everything and checking the field out from almost every angle. Just down the 3rd base line from home, we grabbed a couple sausages and sat down to watch the Angels taking batting practice. 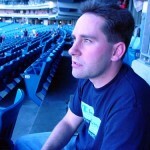 It was funny to see how Bob reacted to things, like sitting in seats we didn’t have tickets for. 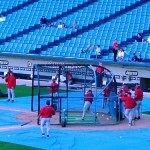 He was worried we would be thrown out for doing it, even during BP. NEWBIE! 🙂 But to watch him following the balls as they were hit out of the park, the excitement in his eyes, was awesome! 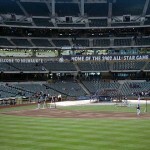 Just before game time we made our way to our seats, the bleachers in left field. We actually had 2nd row seats, but decided to grab a couple empty seats in the top row, near the closest beer stand and restroom. 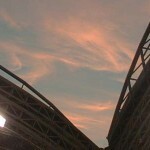 😉 The thing we both remember the most is that after the sun ducked behind the upper deck, the field seemed to glow! It was pretty cool. 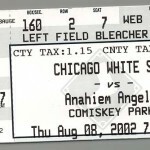 I know most people can’t stand Comiskey and when you compare it to other parks that followed soon after, like Camden Yards, I get that… but we had a great experience and this was my 2nd great experience there within 3 months. The game was a good one, Parque vs Sele. 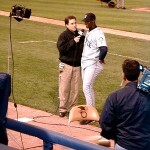 Parque went 5 1/3 innings, which was 5 1/3 longer than the last time I saw him pitch there (May 2, 2002). Gil went deep for the Halos and both Lee and the Big Hurt did the same for the Pale Hose. 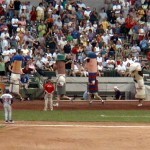 The home team held on for a 3-2 win. The game was secondary to the night really. It was about 75 degrees at game time and while Bob was able to down a few and let go on his first vacation in years, I was playing DD for us, the real entertainment were these 2 ladies across the aisle from us that just kept pounding them back. After the game we took the obligatory pictures of us by the scoreboard and then hit the road to Dubuque, IA. The drive was great, the views of Chicago at night, with the windows down, was something special. 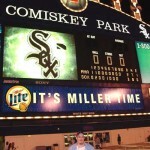 Bob says he will never forget our time on the South Side. 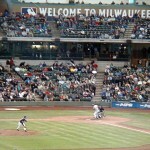 I was at the afternoon game in Milwaukee and it went to extra innings, actually extra inning as it ended in the 10th. 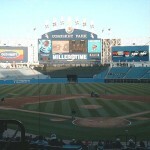 I had to hit the road and make the drive down to Chicago and while traffic was heavy, I made it to Comiskey Park about an hour before game time. I had been warned about going to the South Side and wearing gear from an opposing team, yet there I was decked out in Mariner’s blue! 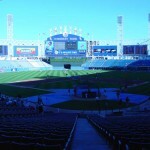 Comiskey is a HUGE park! The upper deck seems to just keep going and is sooo steep! 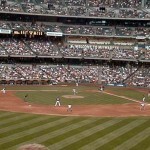 I luckily had a seat down the 1st base line, 1 row down from the main concourse. As I walked around the park, checking out things like the White Sox Hall of Fame, the sight lines and looking at the food they offer I got hungry, so I got in line to get me a Chicago-Style Dog. As I stood there, just a couple sections from my seat, I saw someone go to put ketchup on their dog and literally heard several people GASP! I like ketchup on my dogs, normally, but it was that day that I learned you don’t put it on your Chicago dogs! I got to my seat just in time for the Star Spangled Banner to be sung and the game to begin. This one got started off FAST, like shot from a cannon! 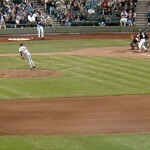 Ichiro led off being hit by the very first pitch, the next pitch Bret Boone hit for a 2-run HR. 4 pitches later and Mike Cameron hit a solo shot! 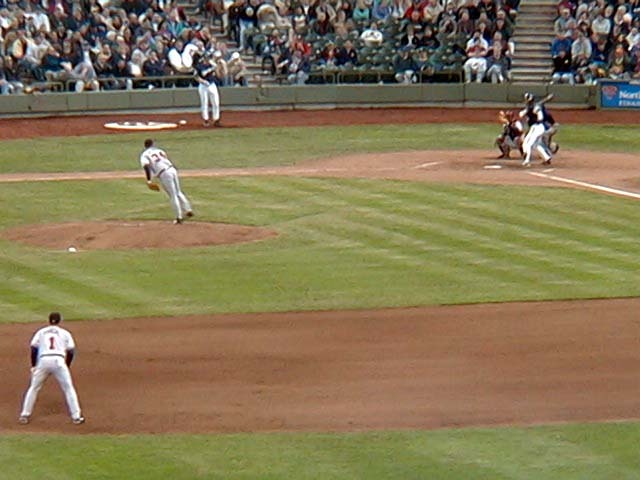 3 batters in, 3-0 Mariners, but it didn’t end there. 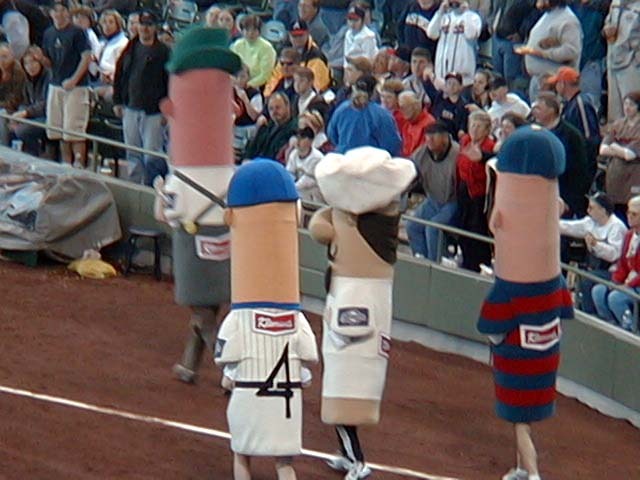 The Mariners added 2 more before their first out and Jerry Manuel replaced Rauch with Parque on the mound. 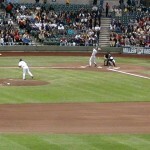 Ichiro grounded into a fielders choice and then Boone took the 1st pitch of his next at bat and JACKED IT! 9-0 Mariners. Boone has now seen 2 pitches, and hit both of them out of the park! It took Cameron 7 pitches before he hit his 2nd homerun of the game and when Olerud grounded out, the top 1/2 of the 1st inning ended, 10-0 Mariners!! During the top of the 1st I had an usher wallk over to me and appologize for giving me a bad time about my Mariners gear, jokingly of course, cause of the score. He ended up stopping by a few more times during the game as well. Also during that inning a couple showed up in the seats to my right who were driving on their way to a wedding in Iowa, saw they White Sox were in town and decided to stop and catch a game. The score stayed the same until the 3rd inning when Cameron took an 0-1 pitch and deposited it beyond the center field fence for his 3rd HR of the game!!! 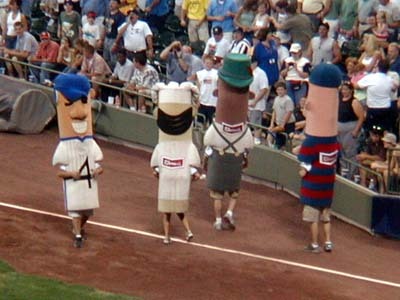 The Mariners picked up 1 more to make it 12-0 at that point. The White Sox got 1 in the bottom of the 4th but the Mariners got it back when Cameron went yard for his 4th time in 4 at bats!! In his next at bat Cameron was plunked on the backside and the White Sox pitcher was actually booed by the White Sox fans, it was awesome! 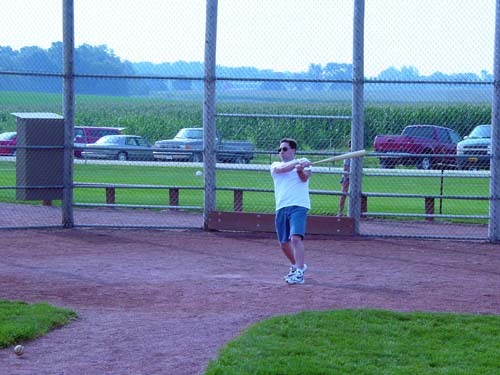 In his last at bat, he sent a shot flying to right that had the fielder pressed up against the wall to catch it. I just knew it would be home run #5, and he would be the only player to do that, but it fell just short. This was an amazing game, I mean heck, even Jeff Cirillo got an HR in this one. When it was all said and done, the final score was 15-4 Mariners!! 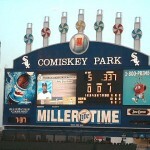 What an incredible introduction to Comisky Field. 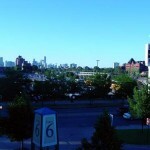 I had a great time on the South Side of Chicago and if I could go to a few more like this one, I would go back often. 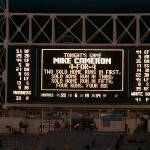 1) Mike Cameron became only the 13th player to hit 4 Home Runs in a game. He joins a list of players that does NOT include names like Babe Ruth, Hank Aaron, Barry Bonds or even the player Cameron was once traded for, Ken Griffey Jr.
2) Cameron and Boone are the first and only teammates to go back-to-back TWICE in 1 inning. Not even the greats Maris & Mantle can say they did that. 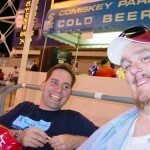 3) My cell phone rang off the hook from friends and family who knew I would be at the game. I spent a good part of the game answering my phone. 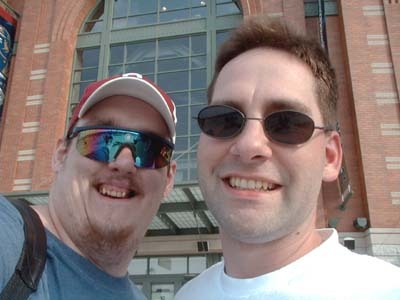 4) Talk about lucky, I was lucky to be at this game, but the couple that showed up next to me that just happened to stop for the night so they could catch a game and whatta game they saw… MLB HISTORY! 5) Not to say that Rauch or Parque had a bad game, but they were both sent down to the minors immediately following this game! 6) Today I saw 2 games in 2 states, 1 NL and 1 AL all on the same day. Man that’s awesome! 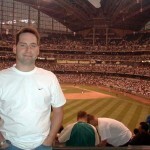 I stayed the night on the south side of Milwaukee, in a Motel 6 that wasn’t too bad. I wish I had known more about where the park was before I boooked that hotel, cause the traffic in Milwaukee is terrible, due to horrible roads and road construction! 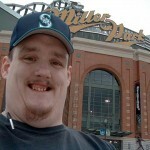 I wasn’t but about 10 miles from the ballpark, but it still took me almost 45 minutes to get there, if not more. Today was actually a pretty nice day, but the roof was still closed. I was told by some locals that they keep the roof closed in April/May just because it’s usually not that warm and most cases it’s pretty chilly. On my way into the park the sun was shinning, there was some blue skies, yet there was a nip, so I guess they know what they are doing. Since I was just here last night, I didn’t spend as much time exploring the park today. 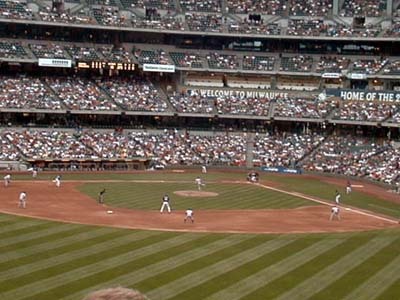 Today was all about relaxing, watching the game and hoping it would be over in time for me to make the drive to the South Side of Chicago for the Mariners vs White Sox game at 7:05pm. 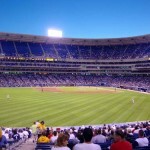 I have been a Braves fan since 1983 when I lived in Oklahoma and the only baseball we got on TV regularly was the Braves via TBS. 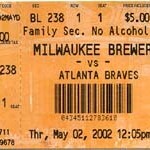 I also have to admit that these 2 games, last night and this afternoon, are my first 2 Braves games ever. 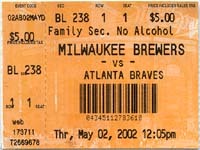 With that said, I was so excited to see Kevin Millwood pitching for the Braves. Got to see Glavine last night, and Millwood this afternoon. While his outting wasn’t the greatest, Millwood did go 6 innings, giving up 6 hits, 2 runs (both earned – including a MONSTER SHOT by Richie Sexson in the 4th inning that tied it up at 1-1). He also K’d 4 on 83 pitches. 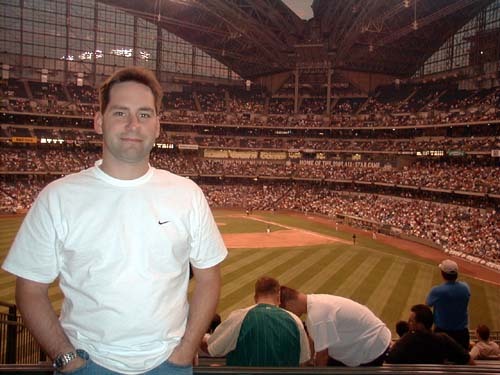 Knowing I had to rush to get to the game in Chicago, my worst fear was extra innings and after the Brewers failed to push across a run in the bottom of the 9th, to extras we went, tied at 2-2. My biggest worry was that if the game ran long, the traffic headed out of town and getting into and through Chicago would make me late for that game. 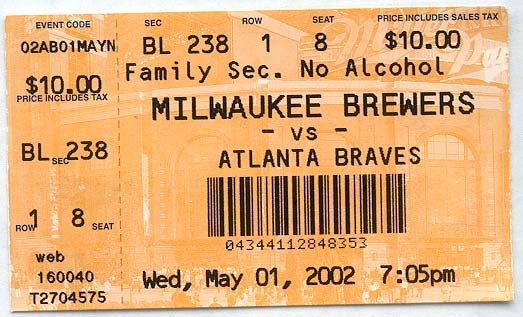 My worries didn’t last long cause Henry Blanco led off the 10th for the Braves (a former Brewer) and drove DeJeans 1-2 pitch over the wall for a 3-2 Braves lead. Smoltz came in and made sure that’s where it stayed. Braves win and I am on my way to Chicago! 1) Sitting next to me was a guy and his son. They used to live in Olympia, WA, and he worked as a cook at a restaurant in downtown Olympia that I have been to a time or two, the Oyster House. 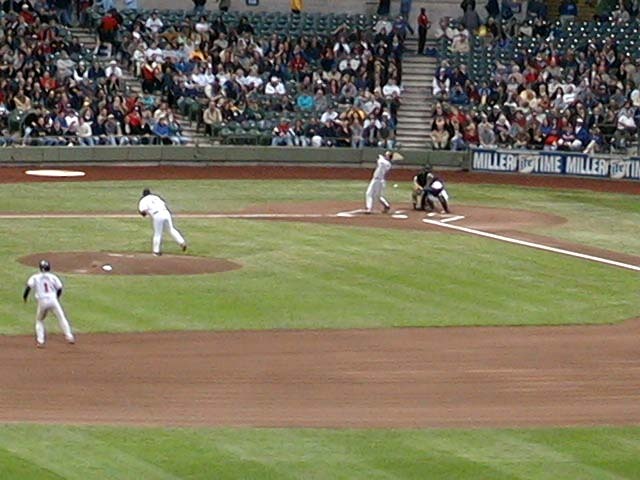 2) Continuing with the small world theme… Brewers starting pitcher, Glendon Rusch, is originally from Seattle and the Brewers starting Left Fielder, Geoff Jenkins, is originally from Olympia. 3) While the roof was closed, and it wasn’t raining outside, there was water leaking from the roof that got the seats in a row a couple over from me quite wet. Thankfully nobody was sitting there. 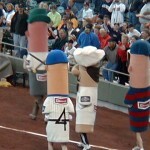 4) The Suasage Races are too much fun! 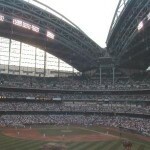 If you ever make it to a game in Milwaukee, make sure you check them out. 5) I sat in the same exact row, just a few seats over, that I sat in last night and yet my ticket today was $5 and it was $10 last night. Go figure! I flew into Chicago with the plans of hanging out with a friend of mine. She told me she would be busy the first couple days I was in town, so I decided to go catch a couple baseball games. 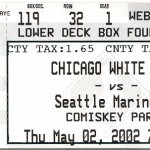 My original plan was to catch the Mariners at Comiskey for a couple nights, but as I got into town it was raining, and raining pretty good. 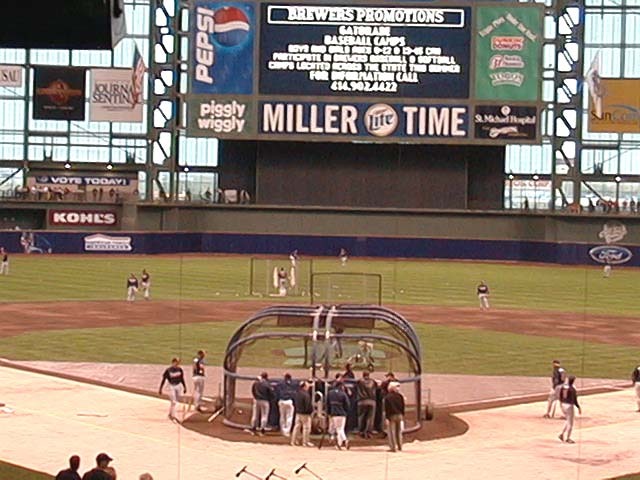 It was then I remembered that Miller Park has a roof and it was off to Milwaukee for me, cause I knew they would be playing. 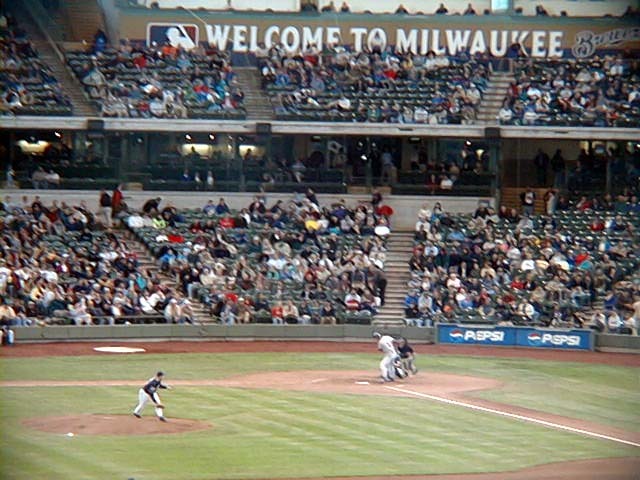 I already had tickets for the game on May 2nd, 12:05pm, at Miller Park with the plans of leaving the game in time to make it to Comiskey for the night cap, so catching 2 games would be awesome. 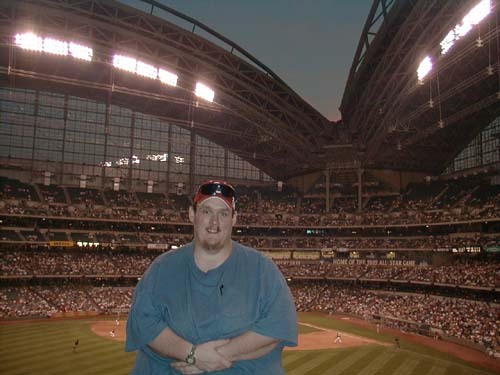 I got to Miller Park, parked and then started looking at all the people who were tailgating. I was amazed, cause while I had heard about it, I had never seen it. People with BBQ’s set up, charcoal kinds no less, ice chests of beer, the works. After taking a few moments to check that all out I had to start looking for a ticket booth to see what I could get. I usually go for the bleacher seats and today was no different, finding myself in the front row of section 238, which is the “Family/No Alcohol” section. After getting my ticket I walked around outside the park taking it all in. Much like with The Ball Park in Arlington, I loved the brick work with the green steel. 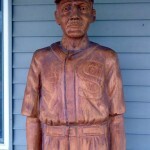 They have statues paying tribute to Hank Aaron and Robin Yount that look cool. They also have one dedicated to those that helped build the park, which was a very nice touch. From here you can see the Little League field that sits where the old County Stadium used to be. 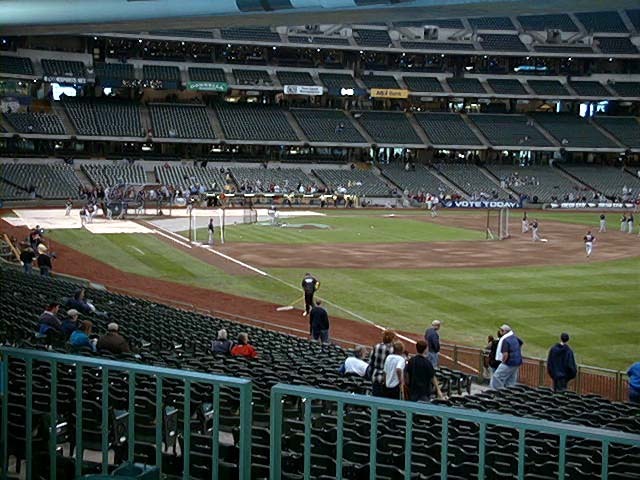 As I made my way in the initial feel I got was similar to Safeco Field, when the roof is closed. I walked around checking out all the nooks and cranies and the sightlines were great. There was only a small handful of places where you couldn’t see the entire field, not to shabby if I do say so. When I was getting close to my seat I decided that I needed to get myself a Brat with some kraut and let me tell you, it was AWESOME! 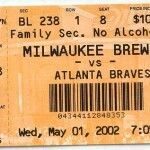 The game started with a bang, a bunt single by Furcal, a K by Giles and then on a 1-1 pitch, Chipper Jones goes yard! 2-0 Braves! Then in the 3rd inning, on a 2-1 pitch, Giles went deep! 3-0 Braves. 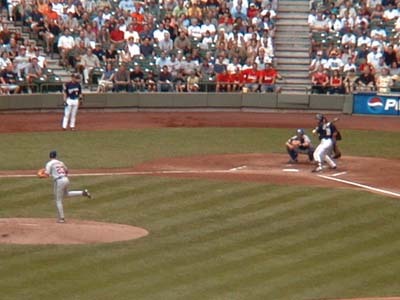 Tom Glavine was tossing a great game, allowing only 2 hits until the 8th inning when he gave up a solo HR to Hernandez. That’s where the scoring ended, with the Braves winning 3-1. As I left the park, it was POURING rain! 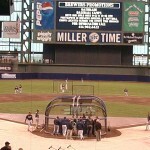 This is why I was glad to go to Milwaukee, cause they had a roof and we stayed dry thanks to it. I didn’t have much of a walk to my car since I opted for the “Preferred” parking for $12. Sorry to all those who didn’t. 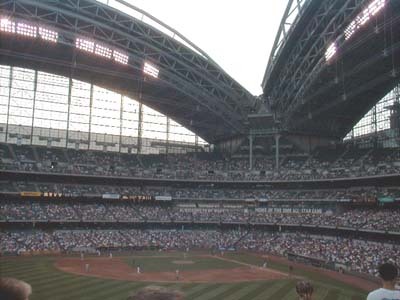 1) The roof is awesome. The design is nothing like we have seen before, be it in Seattle or Arizona or even Toronto. 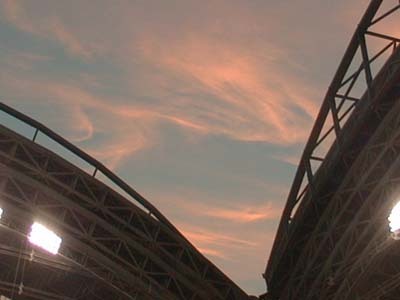 This roof opens and closes sorta like a fan. Its pretty cool. 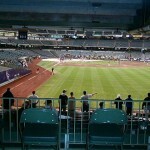 2) You can get day of game seats for $1! 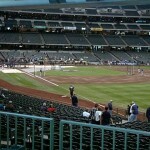 They are partially obstructed view and they are called the Bob Uecker Seats. 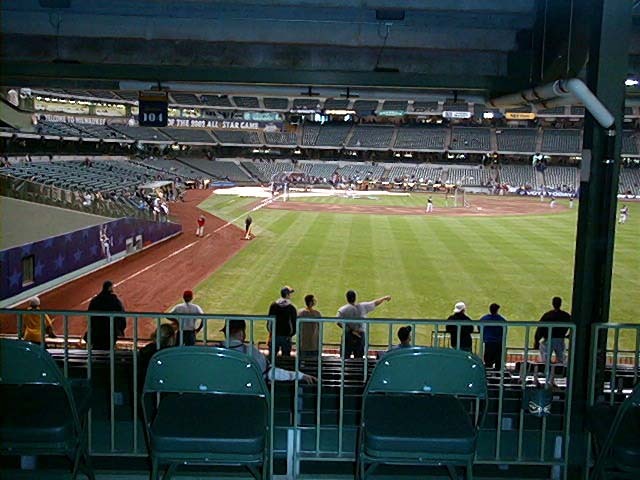 You have a pole in your sightline, but for $1, you’re in the park and can walk around all you want. 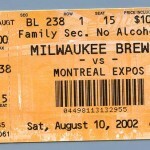 3) There are some really dedicated fans who support their Brewers to no end. 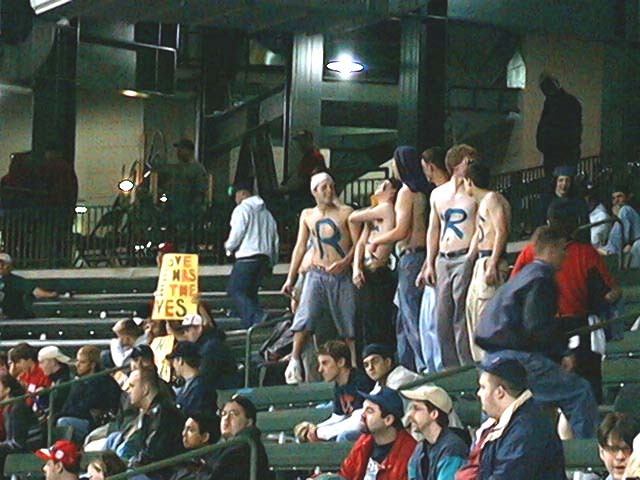 There was a group of said fans 1 section over from me that were really supporting Richie Sexson and trying to get everyone to vote for him for the All-Star game (held in Milwaukee later this year). 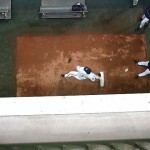 4) My seat was directly above the Brewers bullpen. 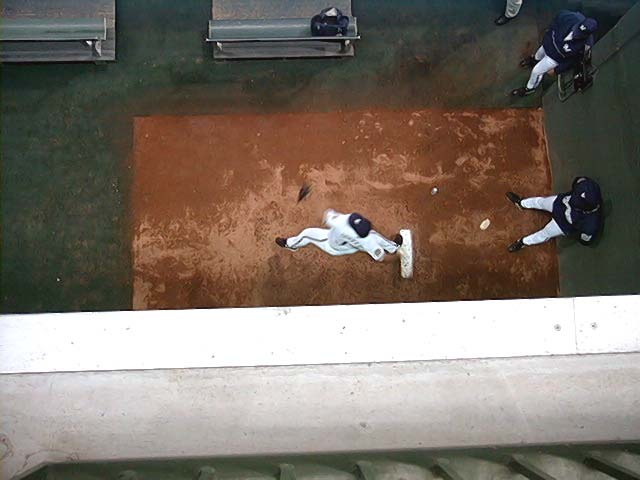 Was kinda cool to get to look down and watch the pitchers warming up.